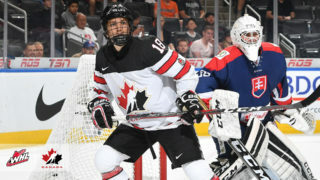 Moose Jaw Warriors Captain Josh Brook is one step closer to living his World Junior dream. 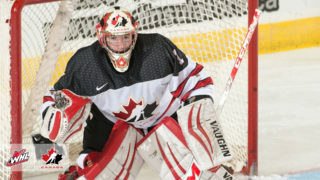 Brook was one of 34 players to receive an invitation to Hockey Canada’s World Junior Selection Camp. He is one of seven players from the WHL that will be attending the camp. Brook currently sits third in Warriors scoring with eight goals, 21 points, and 29 points in 22 games, which ranks 4th in WHL Defencemen scoring. 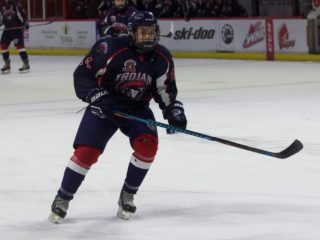 Drafted 4th overall in the 1st round of the 2014 WHL Bantam Draft, Brook is currently in his fourth season with the Warriors, in 167 regular season games he has 23 goals, 88 points, 111 points, and is a +85. In 31 career playoff games, he has four goals, 14 assists, and 18 points. Brook was selected by the Montreal Canadiens in the 2nd round, 56th overall, at the 2017 NHL Entry Draft. He signed an entry-level contract with the Canadiens in September. Joining Brook at the selection camp is Warriors Head Coach Tim Hunter who was previously named the Head Coach for Canada for the 2019 World Junior Hockey Championships. Tim was an Assistant Coach with Canada at the previous two World Juniors where they captured gold (2018) and silver (2017) medals. Hunter has 159 wins on the Warriors bench is the franchise’s all-time wins leader, he also ranks second in games coached with 289. 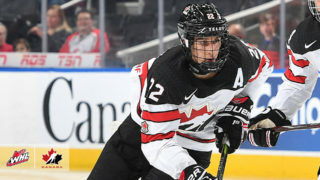 Hockey Canada’s 2018 World Junior Selection Camp is December 11 – 14 in Victoria, the Canadian squad will then trim its roster to 22 players who will take part in the 2019 IIHF World Junior Championships December 26 to January 5 in Vancouver and Victoria. Canada opens the tournament Boxing Day against Denmark, they’ll also have preliminary round games against Switzerland, the Czech Republic, and Russia.